Whilst all bourgeois eyes are fixed on the G20 summit in Buenos Aires or the Ukraine-Russia conflict in the Sea of Azov the class war goes on around the planet. We have already published on the strikes currently convulsing Iran more than once and now we have received the following report and comment on a revival of strikes in Russia from a sympathiser there. Recently, the number of strikes in Russia has increased significantly. Among the highlights of this year are the strike of gold miners in Kamchatka, the strike of transport workers in Chelyabinsk, the strike of drivers and conductors in Vladimir and some others. In Chelyabinsk, the strike, lasting only a few hours but ended in complete victory for the strikers! 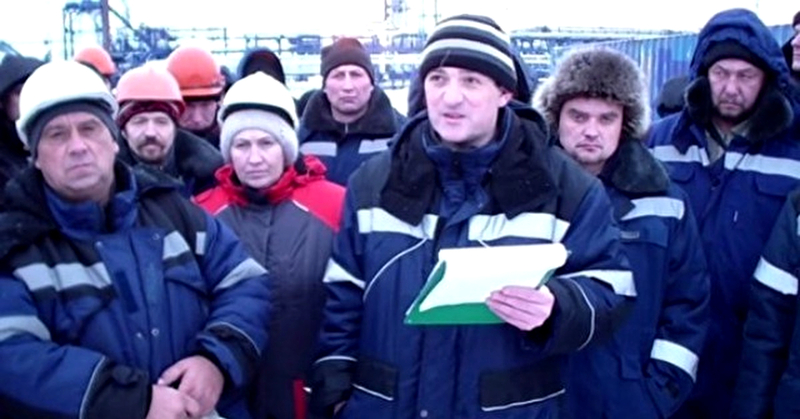 In Vladimir, officials also made concessions to the workers. Unfortunately, the gold miners' strike ended in failure. But there the balance of forces was so one-sided: the employer himself, the court, the prosecutor's office, and the Federation of Independent Trade Unions of Russia came out against the workers, in addition, the Internet was turned off. As a result, they managed to suppress the strike. And yet, even this unsuccessful strike for the workers did not go without consequences. “Gold of Kamchatka” increased the miners’ wages after the strike, according to the regional authorities of Kamchatka. In all divisions of Kamchatka Gold, JSC the system of remuneration has been changed, the company management has increased the fixed part of the workers' wages, the KAMCHATKA-INFORM agency was informed by the Kamchatka regional government. The ratio between basic wage and bonus was 70/30 previously, but now it has been changed to 80/20. Also, employees of the company will begin to transfer compensation payments for passing pre-shift and post-shift medical examinations. In addition, wages will be indexed at 3 percent. “I am pleased that we managed to find a compromise with the management of Interminerals LLC and the employees of the gold mining enterprise. The requirements of the team are partially satisfied, which allows us to hope that the conflict situation has come to its logical conclusion. All employees of JSC Ametistovoe, with whom the employment relationship was terminated, were removed from the field. At the expense of the company, tickets to the so-called assembly points, the people closest to the place of residence were purchased, hotels in Petropavlovsk-Kamchatsky were paid. Seventeen of the thirty-six laid-off workers offered to return to the enterprise. I hope the leaders of many companies, and not only the mining sector, will make correct conclusions after this precedent: no matter how difficult the situation is, it is necessary to maintain a constructive dialogue with the workers, to be able to listen and hear people,” said Kamchatka Krai Governor Vladimir Ilyukhin. Thus, we see that a strike is an effective weapon for the workers in the struggle for their rights. With proper organisation, with the general solidarity of the workers, the strike often wins, as it was more than once. The workers manage to either fully defend their rights, or to achieve significant concessions from the administration. But, of course, in order to wage a full-scale class struggle, the former and “new” bureaucratic trade unions are not suitable: they have their own bureaucracy, a hierarchy of, paid functionaries, and they do not intend to question the existing social order of injustice and injustice. That is why it makes sense to unite into informal proletarian organisations — the Workers' Councils, which are also fighting for the daily needs of the people — and for the new free society of universal self-government. The self-organisation of the daily struggle must take place directly in the mass of the working class itself, bypassing and against the trade unions. It is the workers themselves who must choose for themselves the most effective forms of struggle, which by their very nature will be incompatible with the norms established by the capitalist system. In the course of this struggle for immediate material interests, it should never be forgotten that the common interest of our class is in the overthrow of capitalism, and that the economic struggle must be inextricably linked with the struggle to achieve this goal. In order to fight against the capitalists, the proletariat can rely only on its own forces, on the strength of its numbers, on the strength of its organisations. To win, workers need their own class forms of self-organisation to protect their immediate interests.